Such a statement has become quite common, and applied like a coat of varnish over anyone who seems even a tiny bit more self-involved than we like. It’s usually a major overstatement of the situation, but like lots of other psychological terms, it is applied freely when it really doesn’t apply at all. We need to be careful with our words. Words mean things, and contrary to the old “sticks and stone” jingle, they DO hurt. They hurt, and they remain in the human psyche for a very long time. The legend from which we derive the name for this disorder is, briefly, that a very handsome young god named Narcissus saw his reflection for the first time in a pool of water. He fell in love with himself at first sight, and eventually fell into the water and drowned. Narcissus flowers sprang up in the place where he died. The moral of the story is that being totally consume with oneself leads to nothing good. The person who has true Narcissistic Personality Disorder goes way beyond being just a little vain. These people truly believe that they a special, set aside for some glorious destiny in which the whole world will acknowledge their unique qualities, and they will finally receive the glory and honor they deserve. Their envy of others goes way beyond reason, and in some cases can lead them to commit crimes against the object of their jealousy. They are capable of murder, believing they have done the world a favor. Of course, as with any other disorder, there is a huge degree of difference among narcissists. Not all of them are sociopaths! 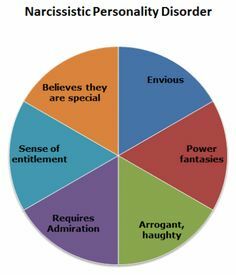 They often present an arrogant, haughty attitude because they alone understand how wonderful they are. The rest of the world needs to catch up. They can be quite charming, lulling another person into believing that they are truly interested. Their only real interest, however, is in self-promotion. They take praise and adulation as their due. They are often innately dishonest, exxagerating their accomplishments in order to achieve whatever status they desire. They are certainly capable of abuse, although most of the time it is not visible. They are master manipulators, seeming to know exactly where to put the knife of sarcasm, belittlement, and criticism to do the most harm. When they are confronted with their nasty behavior, they will raise their eyebrows in shock and claim that you simply must have misunderstood them. They are never wrong. Ever. They don’t apologize for anything unless doing so will further their cause. You can’t win an argument with a narcissist. You can’t reason with an unreasonable person. There is no specific treatment. Talk therapy can help IF the person acknowledges he actually has a problem.